"Sampath Speaking" - the thoughts of an Insurer from Thiruvallikkeni: Venus Williams serves faster ~ crashes !!! A sobbing Johanna Konta overcame slipping and hitting her head off the turf on Thursday to beat world No 1 Angelique Kerber for a spot in the Eastbourne semi-finals. Kerber was serving to save a match point when Konta fell as she stretched for a forehand, landing heavily on her back behind the baseline. Centre Court fell quiet as former British No 1 Sam Smith said on BBC commentary: 'I've seen some awful falls down the years but that is one of the worst.' Konta was down receiving medical attention for five minutes and 20 seconds before she got up to secure a 6-3, 6-4 win in an hour and a half. Every Wimbledon, the British media spreads news on how far the British players could go ~ yet the spotlight would eventually be on William sisters. Serena is away; yet Venus Williams is preparing for her 20th Championships at Wimbledon and, at 37 years old, the 10th seed remains one of the most formidable names in the draw. It has been nine years since Williams last lifted the Rosewater Dish but she has enjoyed something of an ‘Indian Summer’ over the past few months, not least in reaching the semi-finals at Wimbledon last summer. In the absence of her sister Serena, Williams and Petra Kvitova are the only players who knows what it takes to win at SW19, will that experience be able to take the former all the way this year? Williams is royalty at the All England Club, with her record of five Open era wins bettered only by Serena (seven), Steffi Graf (seven) and Martina Navratilova (nine). Those five trophies came between 2000 and 2008 with two further visits to the final ending in defeat at the hands of her sister, who also won in 2009. Since her last trip to the final that year Williams endured her struggles, failing to make the quarter-finals in four years between 2011 and 2015 but enjoyed a pleasant return to form 12 months ago, becoming the oldest woman to reach a Grand Slam semi since Navratilova in 1994 before falling to Angelique Kerber. 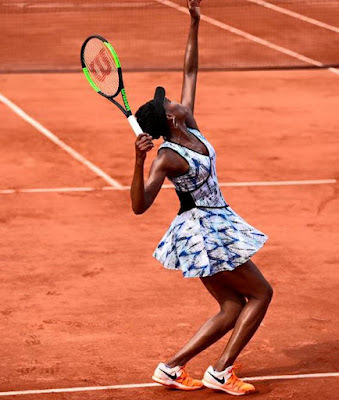 Venus Ebony Starr Williams is regarded as one of the all-time greats of women's tennis and who, along with younger sister Serena Williams, is credited with ushering in a new era of power and athleticism on the women's professional tennis tour. This year she is not even in top 10 – low from the days when she became no.1 in Feb 2002. In 2002, Venus and Serena became the first sisters to hold the No. 1 and No. 2 spots in the singles rankings, respectively. In 2010, Venus and Serena again occupied the No. 2 and No. 1 spots in the singles rankings, respectively. At the time, Venus had just celebrated her 30th birthday and Serena was three months shy of her 29th birthday, both ages at which many of their peers had retired. With 49 singles titles, Williams is behind only Serena among active players on the WTA Tour. Her 35-match winning streak from the 2000 Wimbledon Championships to the 2000 Generali Ladies Linz tournament final is the longest since Jan 2000. Her sister Serena Williams is generally seen as more power and daring. Serena became the world no. 1 for the first time on July 8, 2002. On the sixth occasion, she held the ranking for 186 consecutive weeks, tying the record set by Steffi Graf for the most consecutive weeks as world no. 1 by a female tennis player. Now she is on an announced a hiatus from tennis until 2018 because of her pregnancy. This is no post on whether Venus will win Wimbledon but on the damage to her car and to people caused when she darted into the middle of an intersection, causing an elderly couple to slam into the side of her car. Linda Barson was driving with her husband Jerome, 78, in the passenger seat when the crash happened. Mr Barson was hospitalized for serious head injuries after the crash and died two weeks later. His wife is now suing Williams for causing the crash. The photos from the crash scene show the Barsons' vehicle crashed on the side of the road, with the front of the car completely crumpled in on itself. The airbags appear to have deployed in the front, and the back windows are shattered. 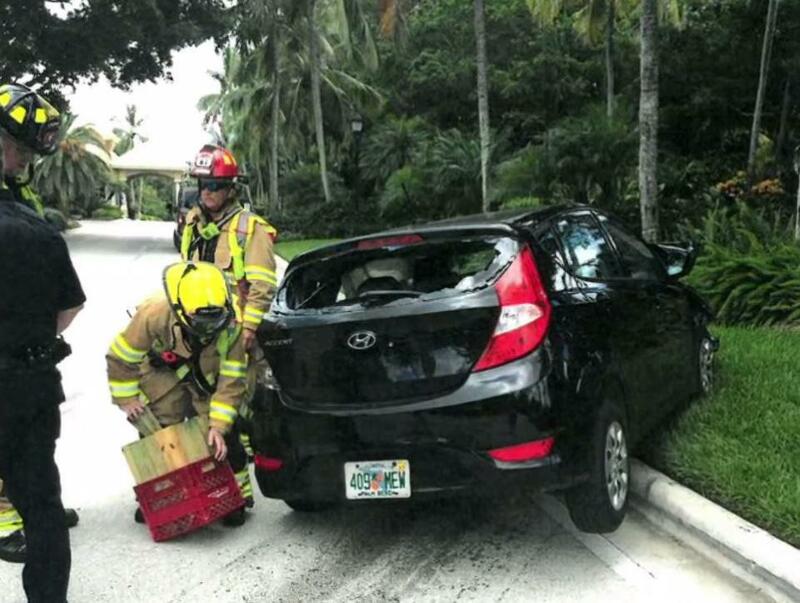 The couple's back window was smashed after the accident on June 9 in Palm Beach Gardens, Florida. The 37-year-old, seven-time Grand Slam champion reportedly told police she did not see the couple's car and she was driving slowly. Media reports suggest that she was at fault. Police say there was no evidence Miss Williams was under the influence of drugs or alcohol, or that she was distracted by a phone. The victim family are now seeking unspecified damages for loss of companionship for both Linda and their family, loss of earnings, pain and suffering, and medical and funeral expenses. Mr Barson's wife said Miss Williams' SUV 'suddenly darted' into the intersection and there was no time to stop before she crashed into the side of the tennis star's vehicle. According to the lawsuit, the impact was so severe their car was 'crushed, the front windshield shattered, the airbags deployed, there was crush damage to the rear on the driver's side, and the back window was shattered.' The couple were married for more than 33 years and the lawsuit said Mr Barson died on his 68th birthday. The crash came five days after Williams lost out in her record-breaking 20th French Open to 30th seed Timea Bacsinszky of Switzerland on June 4. This is not the first trouble Williams has had on the roads. In September 2009 she was stopped in a Mercedes Benz by the Jupiter Police Department and cited for driving with no proof of her insurance. On July 3, 2013 her Toyota was involved in a crash on I-95 in Palm Beach County, and was cited for driving on a suspended or revoked license.